Thank you for your interest. Click to find out how you an order Little Giant products now! Click to browse our interactive catalog, download the PDF catalog, or request a printed copy by mail. Manufacturing Heavy-Duty Material Handling and Industrial Storage Solutions for over 100 years. 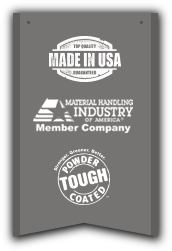 Little Giant products are manufactured in the USA by Brennan Equipment & Mfg. Inc. Our extensive line of innovative Material Handing & Industrial Storage solutions is the result of over 100 years of history in manufacturing excellence. Our products, featuring all-welded heavy gauge steel construction with a tough powder coated finish, have earned a reputation for strength, durability and longevity, even in the most demanding applications. Little Giant products provide real solutions for your material handling needs. We also offer engineering and design assistance on custom equipment for lean initiatives, special applications and integrated systems. From welded industrial carts and high-capacity workbenches to heavy-duty industrial storage and safety products, Little Giant products deliver both quality and value. Little Giant products are readily available through a nationwide network of industrial dealers and distributors.